This is another great perspective piece from artist David Story. This outstanding sketch includes some interesting notes he has made in the margin. 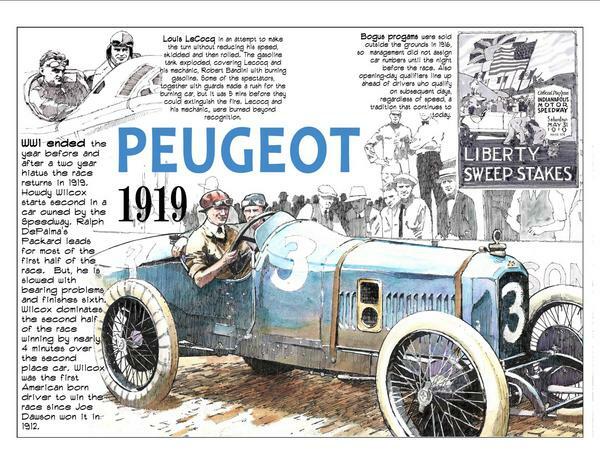 The art captures an image of 1919 Indianapolis 500 winner Howdy Wilcox and his Peugeot racer. This race marked the fifth year in a row that a European manufacturer won the race and the third for Peugeot who also won the 1913 Indianapolis 500 with Jules Goux and the 1916 classic with Dario Resta. The one thing that made this Peugeot different from previous issues is that this one had been purchased by Speedway co-founders Carl Fisher and James Allison. Allison had established an engineering company near the Speedway Prest-O-Lite offices. There is a good chance that this winning car was reverse-engineered in Allison's shop. Indianapolis Motor Speedway officials led by President Carl Fisher re-opened the grand facility after a two-year hiatus for World War I when Speedway grounds were used as a training grounds for early military airplane pilots. Called "The Liberty Sweepstakes," the race underscored the celebration of a free people's ability to attend such grand events. Wilcox, born in nearby Crawfordsville, Indiana was one of many native-born "Hoosier" drivers from the early days of the "500." As noted in David Story's notes the first half of the race was dominated by Ralph DePalma and his Packard racer but mechanical maladies robbed him of the speed he needed to maintain the pace. He eventually finished sixth. Even less lucky were driver Louis LeCocq and his riding mechanic Robert Bandini who were killed in a fiery crash on lap 96. Earlier in the race, on lap 45, Duesenberg driver Arthur Thurman became the first driver to lose his life during the running of the Indianapolis 500. His riding mechanic, Nicholas Molinero, was critically injured but eventually recovered. In a bizarre incident driver, Elmer Shannon was slashed across his throat after Louis Chevrolet's Frontenac threw a tire and the hub sliced a timing wire stretched across the brick running surface to fling it back at Shannon in his Mesaba-Duesenberg racer. Immediate medical attention spared the driver's life. Look for more sketches from David Story here in a special collaboration with First Super Speedway. 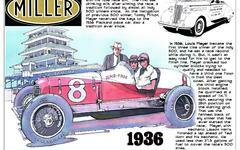 Take a look at his sketches of other Indianapolis 500 champions Ralph DePalma, Joe Dawson, Jules Goux, Rene Thomas, Dario Resta, and Ray Harroun.